An array of lanterns glow in the night air, adding a festive mood to Nantong, East China's Jiangsu province, as Spring Festival, or Chinese New Year, draws near. 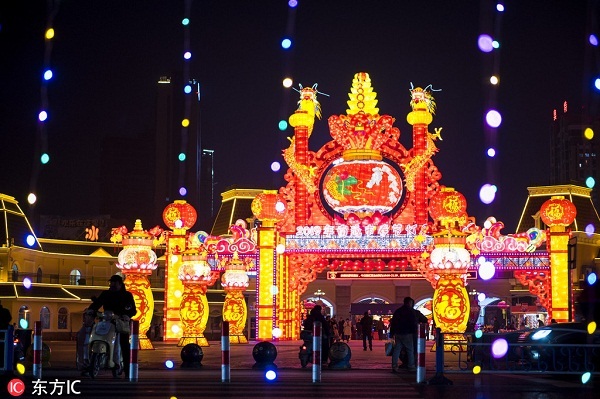 Despite the low temperature after sundown, local residents flooded into Nantong Adventure Land to view the whimsical multicolored display on Jan 18, the opening day of the 2019 New Year Lantern Show. The event features artistic LED installations with Chinese cultural elements, such as depictions of lion dances, auspicious animals for the new year and paper-cuts. The show will run from Jan 18 to Feb 24.